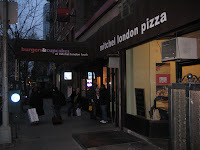 (former chef to ex-NYC Mayor Ed Koch) and even though its not in the name, also serves pizza. The place doesn’t serve alcohol but will let you bring your own in. So hit the bodega on the corner before you come in, which is exactly what Jenn did! Even though it wasn’t busy, it still took the waitress a good 20 minutes before she took our order. Out of several types of burger, I of course, went for a beef burger cooked medium rare with shaved Parmesan and hickory smoked bacon. When it arrived without any bacon (they ran out) and on a plain white bun, my hopes weren’t high. The burger was cooked the way I ordered it but there was hardly any cheese on it and the burger itself was kind of plain. Not bad but certainly not award winning. But burgers were only half the meal. We had to order cupcakes. 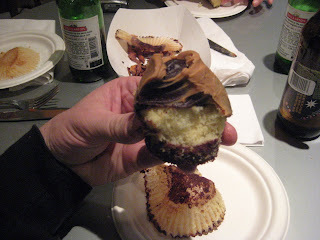 Although they were out of a good half of the menu selection, they still had marble cake with peanut butter cupcakes. Mmm. Get in my mouth! The cake was moist and minimal. Let’s be honest, no one is REALLY into the cake part. 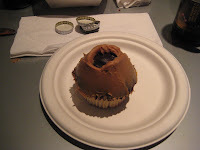 The peanut butter and chocolate was really creamy and filled with flavor. I was glad I ordered a small but it was addictive enough to want a large cupcake. In the end, its the cupcake that’s the winner but the combo is still a unique idea. It’s like boys and girls can finally agree on a place to eat! First and foremost I have to say that I’m honored to review the first ever veggie burger on the conquest. Thanks REV!!! To the die – hard meat eaters on the site, my apologies. I promise to go and slay some raw meat in your honor this weekend. 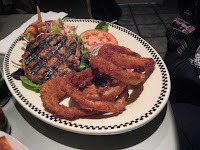 That said, I do wish that it could have been ANY other burger in the world of all veggie burgers to be bestowed with the recognition of first veg burger review. 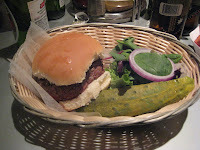 Before diggin’ in I do take notice that this veggie burger is not some pre-packaged frozen job. B+C does make them by hand which is a bonus and gives the illusion that I might have a good experience here…that is, until I take a bite. I’m not gonna sugar coat it. First bite was a disappointment. I’m not sold that this is a true ‘veggie’ burger. Approx. 98% is made of rice with a few minuscule carrot and zucchini shreds tossed in – clearly for color -as it had no taste whatsoever except maybe for the cheese and some ketchup! 2nd bite helped me to deduce that the wonder bread bun action that is adorning this lovely little rice patty is not helping its cause either. Bun off to the side and another taste down and…nothing. No sparks, no fireworks…no love. Bland nothingness. Not even the spicy goodness of pepper jack could save it. Moral of the story. Did I eat the whole thing? Yes. (hey what can I say? 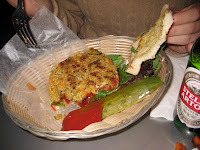 I had high hopes for dinner and didn’t eat lunch b/c of it) Would I visit again? Well, maybe if someone else was buying and I was broke or if I could bypass the whole ho hum veggie burger experience and grab a delicious peanut butter and marble cake cupcake instead! 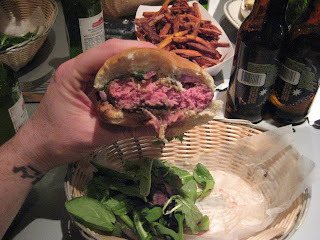 Veggie fans out there…dont bother with the burger…not worth your time. It doesn’t fly high enough on any radar to even register. Ah well, better luck next time. And there WILL be a next time. So, until then, my friends…peace out! 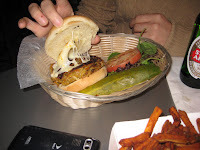 This entry was posted in Burgers, Hamburgers, New York, Veggie Burgers and tagged best burger, burger conquest, burgers and cupcakes, cheese, ciancio, french fries, hamburger, hell's kitchen, mitchel london foods, nyc, rev, review, vegetarian, veggie burger. Bookmark the permalink. As someone who was able to participate in the burgers and cupcakes festivities I must say my high lights were Jenn busting out the BYOB and the rev suggesig the VERY yummy peanut butter and chocolate cupcake. service was meh and so was the turkey burger. The above reviews couldn’t me more spot on. 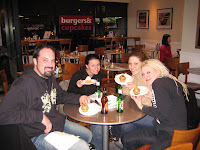 Though the company was great and it was a fun time the burgers left something to be desired. 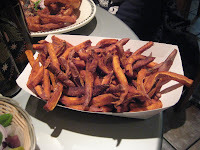 Although i ordered mine medium it came out more on the rare side than medium and the flavors just weren’t there. 2 thumbs up for the cupcake, though sadly I didn’t get to indulge in the peanut butter chocolate one (because i gave up chocolate for lent) the double vanilla action was quite tasty! NO WAY! That is hilarious.